…well yeah, suppose I should have expected this little portrait of myself! This entry was posted in Silliness and tagged celebrity, child, children, comedic, comedy, education, fun, funniest, funny, gold medalist, hagwon, hilarious, humor, humour, ice skater, ice skating, ice sports, kid, kiddies, kids, Kim, Kim Yuna, kindergarten, korean, Korean celebrity, Koreans, olympic, olympic winner, olympics, silliness, silly, sk, south korea, sports, teacher, teaching, winter sports. Bookmark the permalink. Sorry! The link won’t work for a few hours, I have a scheduled post that will be published this morning. If it’s still not working for some reason, in a few hours you can just go to theebdblog.wordpress.com, and it will be the most recent post. Your name is John so may I suggest, Yo-Han. That’s John in Korean. Tell your students to call you “Sung Seng Nim Yo-Han”. Or just “Yo”. Hahaha. Hahaha. Can we have a vlog post with you on ice? I bet your triple salchow is something to behold!!! Back in the day when I was ‘Miss Hobbs’ I told a class of kids that I was heiress to the Russell Hobbs kitchen equipment fortune and I just worked in a school for fun. Never seen eyes go so wide! 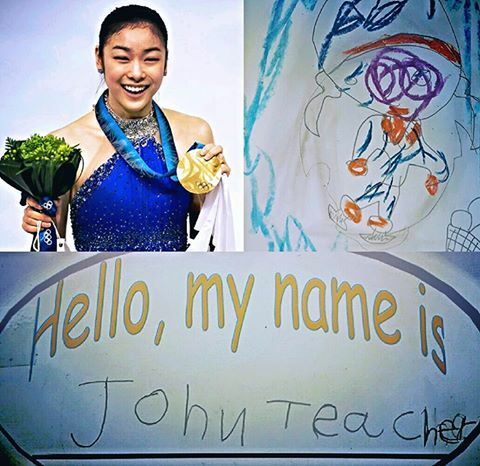 LOL – nice to meet you, Kim Yuna!